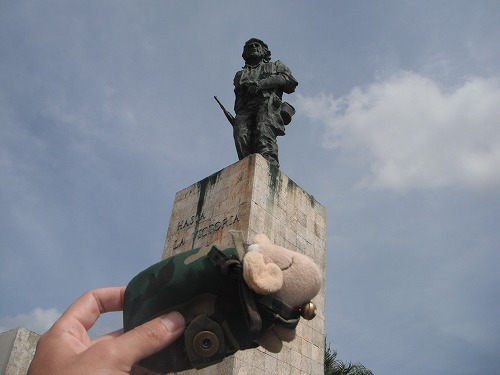 We were thinking to stay a night in Santa Clara, but it seemed like there wasn't much to see except Che Guevara Mausoleum (Mausoleo Che Guevara). And Mausoleum is far away from teh city. So we decided to visit Mausoleum and then go back to La Habana on the same day. The bus terminal of Cienfuegos is located a little far away from Centro and it was shabby. It was our first ride on Viazul bus and the bus was really old and beaten up. It looked like the axle was not straight and the ride was very rough. The make was Yutong as usual, but I could see huge differnce between the modern Yutong and the old Yutong. Chinese manufacturing has been improved very far in these 10 years or so. There was another Japanese backpacker on the bus. His name was Junya. 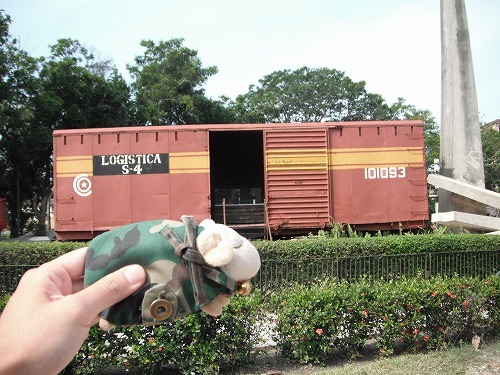 He also was planning to visit Mausoleum and go back to La Habana, so he joined us. 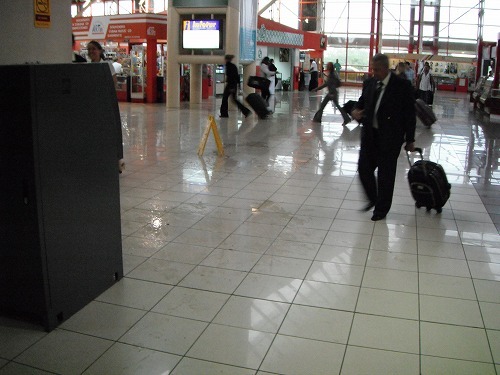 Once we arrived at the bus terminal of Santa Clara, we checked the time table of the bus to La Habana. The earliest bus leaving in the afternoon would be 5pm. It would arrive La Habana at 9pm or later. The fare was 18CUCs per person. Then those taxistas came to us and telling us they can take us to Mausoleum and La Habana with 20CUCs per person. Well, it was not a bad deal at all. Anyway, Mausoleum was far away and we needed to catch a taxi there, and we would not need to waste our time waiting for the bus. So we took the taxi. We made a right choice. The taxi was not a proper taxi. It was a Pugeot 308. It was not that old but pretty beaten up. 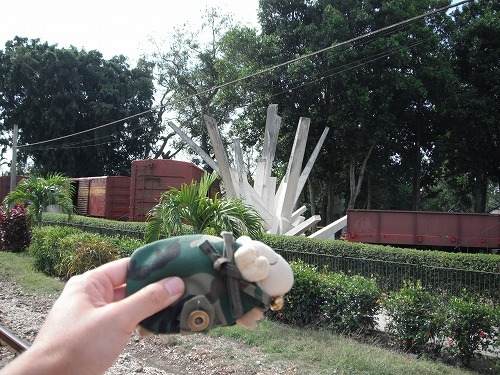 Firstly he took us to the monument where the regiment of Che Guevara blew up the cargo train carrying arms for the gorverment army. 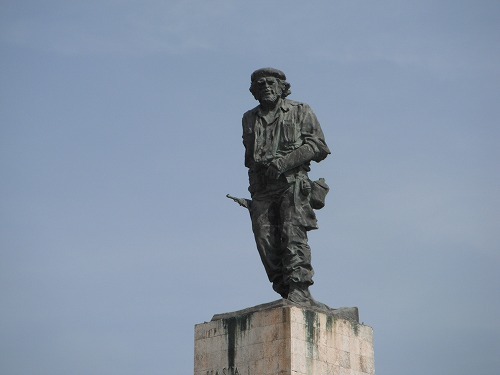 The mission was successful and the rebels (M-26-7) took those arms, and this made the President Fulgencio Batista flead to Dominica. The scene was shown on the movie of "Che - Argentinian". The cargo cars were restored on the sight and we could see them. The railway is still used these days. The enrace (?) of the monument cost 1CUC. 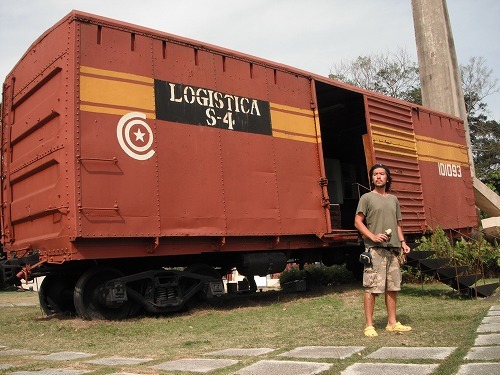 Inside the cargo cars, those arms, the rebels took, were displayed, but nothing was special. 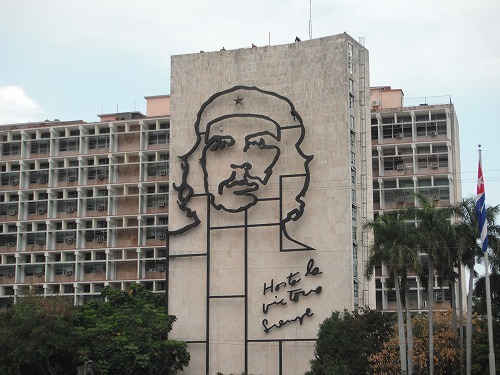 If you are not interested in Cuban Revolution or Che Guevara, it would not be worth coming here. I was excited to be there, and so as Mr Sheep. Then we went to Mausoleum. Finally I got here! He started his trip on two wheels from the South and ended up here. And I started my trip on two wheels from the North and finally I got to get so close to him. I could see the statue of him - so famous now - standing under the blue sky. 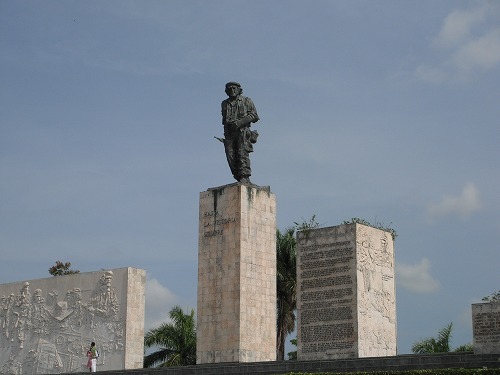 The statue depicts him in the battle of Santa Clara. He broke his left arm, so he was wearing plaster cast and a scarf - presented by his future wife Aleida March - to suspend his broken arm. We took photos of the statue and then went into the museum. Unfortunately, cameras were prohibited there. 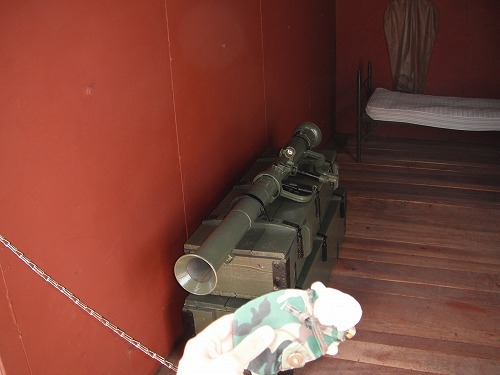 Inside the museum, those goods used by Che himself were displayed. His beret, gun, potable inhaler for asthma, phone, military uniform etc. Then we entered to Memorial where Che and his comrades rest. I did not know we could enter there, so it was a good surprise for me. Inside sourrouded by those comrades, he is resting. There was a relief of each man and woman resting there. There bodies are behind the wall I suppose. 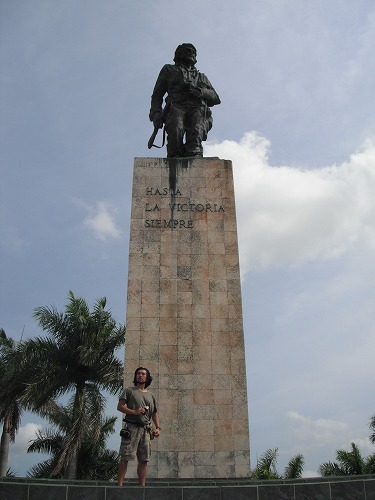 I stood still for a while in front of Che. I reckoned I was only 50cm away from him. "Finally I met you, Ernesto. I will do my best to carry on your legacy." I promised him. As a revolutionalist - I try to be - it was the undiscrabable moment for me to see him so close. He is still fighting for people and equality and fighting against injustice. Back to the taxi, we drove straight to La Habana. We arrived there around 3pm. We checked-in at Joaquina's place. Tom and Toko left us a note and stating they were staying at the Casa they stayed before. After a little rest, we went out for a walk. Then I had a good talk with Junya and another Japanese traveller - the cyclist - Jin. Around 7pm, Tom and Toko came to see us so we went to have dinner in Chinatown. 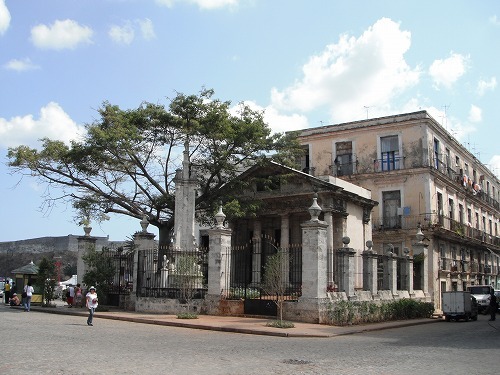 Especially coming back from small towns and cities, we felt La Habana was a really big city. Toko will be back to Mexico early morning tomorrow and Laura will be bacl to Germany on 5th, so we went to look for souvenirs around Obispo street. 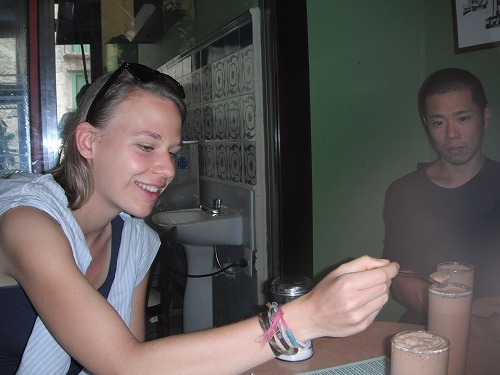 At the Chocolate Factory we had iced chocolate (CUC0.80). It was a little expensive but we deserved a treat. There were many stands around the plaza at the end of Obispo street selling old books, stamps, and pins. 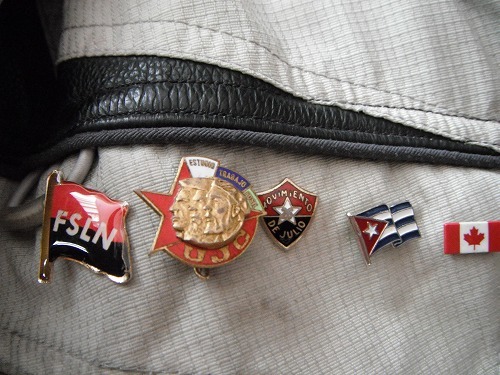 Cuba is a part of the Comminist blocl, so there were many pins from North Korea, PROC (People's Republic of Chiina), and Soviet Union. Toko went to the airport in the early morning. Yesterday she asked one of the taxistas on the street to pick her up at her casa around 2:30am and he came on time (according to Tom). As she left the casa, Tom moved into our casa - Joaquina's place). Junya also needed to go to the airport around noon, so we walked around Obispo street. We found a proper restaurant "La Luz" accepting CUP on Obispo stret, but it was so busy. We were too hungry to wait to be served and Junya needed to leave. So we ate at a food court. A lady said the fried chicken was cheap and nice, so Tom and I ordered 2 pieaces of fried chicken each. They were big but so greezy... They were worst fried chicken I had ever... To make matters worse, it cost 75CUPs (3CUCs) with a drink. Expensive!! I got upset stomach and was not feeling well whole day after that. 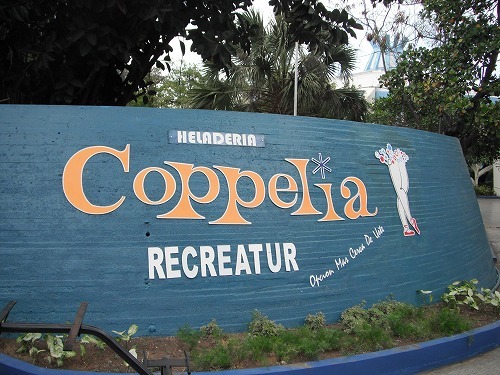 Then we went to Coppelia (the Ice Cream chain store) park where were many Coppelia stands. Toko and Tom went there twice and they said the ice creams there were cheap and good. We took P11 bus to New Town of La Habana. But, but, all the shops accepting CUPs in the park were closed. There were only 2 stands open but they only accepted CUCs!! And it was very expensive, 2.80CUCs for 2 scoops!! The taste was just average.... How unlucky I was!! We had dinner in Chinatown again. We had enough of CUPs meals and other places would be too expensive, so we had no choice. 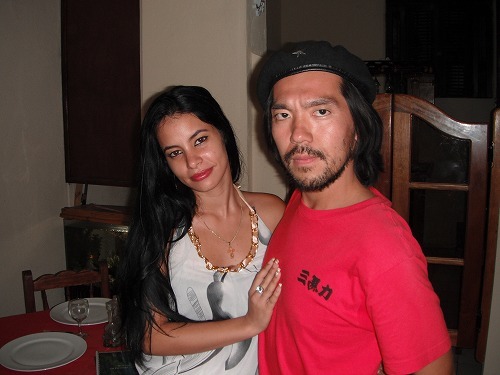 I talked with Tom till 2am about trips, loves, Japan, Cuba etc. I was so glad to have this conversation with you, Tom. After lunch, we went back to Joaquina's place to pack up. We took P12 bus to La Plaza de la Revolucion. 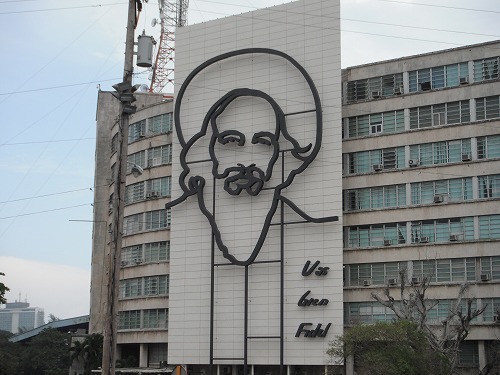 There we took photos of Che and Camilo's faces on the government buildings. 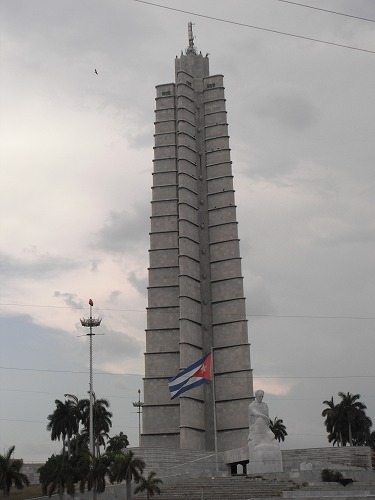 There was the tower of the revolution on the hill top and behind the tower, there was the office of Raul Castro Ruz.. The bus was packed as usual. And the sky got darker and darker. It looked like a storm was coming. We were on the bus for a while, but I did not remember seeing those scenary outside. Around 40mins later, when the bus stopped at a bus stop, I saw outside and on the sign it stated "P1, P2...". I asked a guy "Is this P12 bus? ", and he said "No, it's P2!". Oh now, we got on the wrong bus. It was my fault. I was so sorry to Laura. We quickly got off the bus, but the storm had come already. Very strong wind and heavy rain.... Voy bien Camilo? At the bus stop, I asked those people how we could get to the airport. They said "Either you take the same bus back or catch a cab!". Well, the storm was too bad, so we decided to catch a cab. Luckily we could catch a cab in no time. But the cab was realy old Russian made Lada. The rubber seal of the doors were almost done and water got inside the car. There were many tree brunches on the road. Some parts of the road were flooded!! It was amazing. Surely here was tropic. But we wondered if he plane could take off in this condition?? The cab driver was excited with the storm too. We saw a new Mercedes was stuck in flooded street, but our old Lada went through! He was so high and we were kinda happy to experience this bad storm. We arrived at the airport safely and on time, but it cost 20CUCs. The display showed the plane would be late for 1 hour. There was a long queue in front of the check-in counters. But none was processing passengers. I guessed it was still possibility of cancelling the flight. We waited for a while and finally the checkin process was started. I said good-bye to Laura and left the airport. Well, how could I go back to City?? I did not see any bus and it was still raining, so walking to the main road would be hard. So I caught a cab (15CUCs) to City. On the way back, I asked the cab driver how the economy of Cuba now. 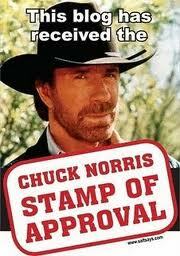 He said it was not getting better, but since Raul was in charge, there were some changes he could see. Back to Joaquina's place, Tom was little sick, so we thought we had little snacks from a CUP shop nearby, but we ended up going to Chinatown. We ordered Chef's recommendation (TOm had chicken and I had pork) and they were very very good. 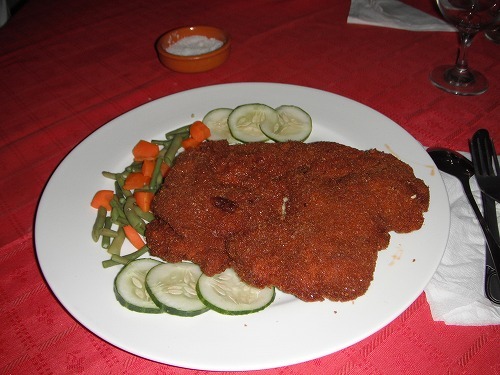 The best meal I had in Cuba. It was 6CUCs but it was money well spent. Tom went to sleep straight after, so I went out for a walk around the city. I have only one more day in Cuba. This is the summary of my two weeks holiday in Cuba. 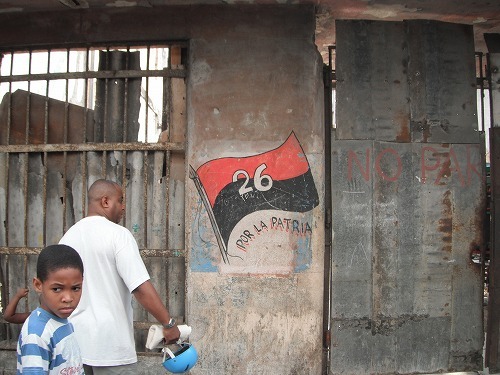 It has been 52 years since Cuban Revolution Army (M-26-7) defeated the US backed Batista regime. 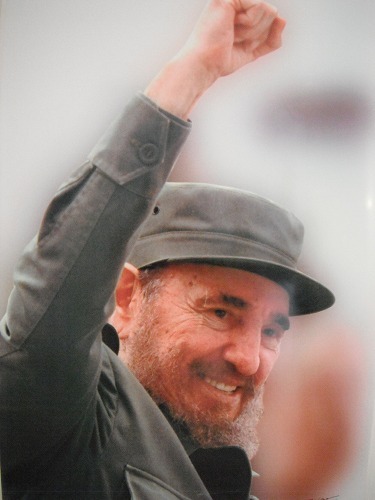 Fidel Castro had been leading the country for nearly 50 years till he retired a few years ago. Cuba survived the US embargo, the fall of the Soviet Union, and economic crisis, and developed its unique Socialism. 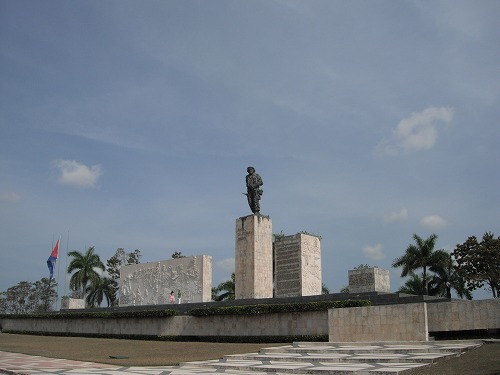 As a revolutionalist, I had lots of expectations towards Cuba. I wanted to feel the history of the revolution and current lives of Cubans with my own skin. After spending 2 weeks in Cuba, I have now mixed feelings. Cuba is now in a situation to rebuild the economy with the tourism and relationship with Latin American countries such like Venezuera after sufering economic crisis since the collupse of the Soviet Union. What I saw was lots of Cubans were depending on tourists money. 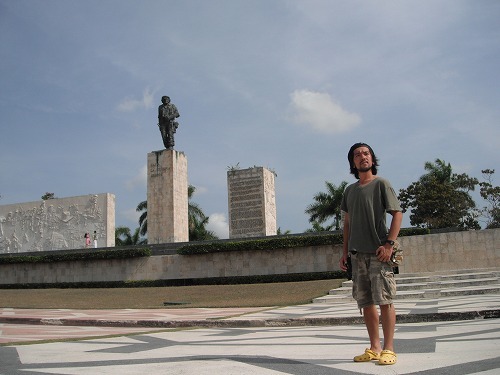 Wherenever I went (well, as a tourist I went to tose touristic places) there were Cubans tried to get "business" with us. I did not see so much "money driven" people in other latin American countries, so I was shocked. When I got on an airport bus to Habana City, all men were waiting for ladies to get on first, so I thought "Cubans have a lady-first culture", but I did not see much of this culture elsewhere. I felt those people tried to get our "business" did not know how to treat foreginers. Whereever I went , cab drivers called out "taxi, taxi" to us many times, and when people came to us with "Hola, amigo!" always end up with "Do you wanna buy cigars? It is special today (everyday is special....)" To make matters worse, they were very persistant and annoying. I guess for them asking is free, and if they get a business, they are lucky, if not, it does not matter, they just try anyway. Oh, so called "Bici Taxi", they are actually three-wheeled, so "Tricicle". Those "Taxi Drivers (Riders) always asked us "Bici Taxi?" or "Taxi, Taxi". Every where we went, even for a short walk, they bothered us. They bothered us so so much, in the final days of our stay in Havana, Laura finally said to them "It's a Tricicle!" Well, finally we got them, Laura. Those poeple came to us did not have good manners either. They often yelled out to us "Hey Chino! (it means Chinese or Asian)" Well, I am an Asian and was called "Chino" in Central Americas. But I did not feel that bad as much as in Cuba. I guess this was because the way Cubans said "Chino, Chino" had the bad intension (racism). I thought what they feel if they were called "Hey, Cuban!" like that way in a foreign country? In "civilised" countries, people would not call other persons that way. It got better in the country side though. Education level of Cubanos seems to be higher than other Central Americans. Lot of people do understand and speak English (not fluently though). But this also leads to more annoyance to tourists. As they can speak English, they followed and continuaslly asked us if we were interested in their "products (cigars, mojito etc)" or "sercices (taxi)". I tended to compare Cuba and other Central Americas, where was (is) dominated / controlled by the States. And I was thinking what was the revolution for the majority of Cubanos? Not all Central American countries are fully independent from the States (such like El Salvador and Panama, I felt strong the US presence), the living standard is getting higher and higher. In contrast, Cuba has been against the States since the revolution and beloned to the Soviet side, the living standard in general seems to be higher than average Central Americans. The majority of Cubanos seem to have basic goods, if not fancy. So the wealth is distributed more evenlly in Cuba than Central Americas. However, if I ask the question myself, "Is there the spirit of Revolutionary or Socialism I could feel? ", I would say, "No, there isn't much." 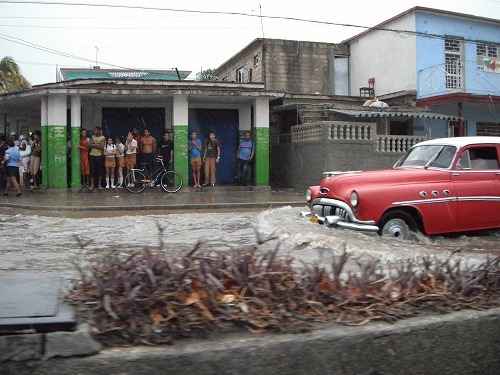 I saw more downsides of the uniqueness of Cuba than good sides, such as bad services, lack of choices etc. In Nicaragua, also over thrown the governemnt with revolution, I felt hope there. But I could not feel that in Cuba. That was really sad truth for me. So far I am criticising Cubanos, but I had good experiences with Cubanos too. All of families at Casa Paticular (like home stay) were very kind. They respect our privacy, but did care about us. There were humble too. However, they charged us for everything (well, except medications when I got sick). I think they were truely kind people, but I might be wrong. The fact is if we stay a night, it will be more than monthly income of averge Cubanos! Basically,they are very cheerful and relaxed. But at the same time (as the most of Latin Americans) they are sloppy. Well I like them because of those reasons. These traits of Latin Americans are "something" we - Japanese- need to learn. Before this trip, I thought a "Socialist" nation would be very different in many ways from "Capitalist" nations. However, in myopinion, there weren't much different from Central Americas. Well, noiceable differences were, less stores, unable to buy things when I wanted, and bad customer service. I reckon those are because there weren't much cpompetitions, but what I felt was, generally speaking, they did not have consideration making customers happy. So if Cuba lose its title of the "Revolution" and the "Socialism" , it will be just "One of Latin American" country. Then there would not be much tourists coming in, I suppose. For the better economy, Cubanos need to improve their ways of doing business to get more repeaters. Unfortunately, there was not encounter that made me feel "I want to be friends with him/her!" At other countries, people came to us for just out of curiousty, but in Cuba (in my experiences), those people came to us were 100% money driven. Ah, one exception. The gentleman Laura and I met on the way to Havana city from the airport. He helped us hitchhike. He was ascientist researching vaccine, so he was highly educated and had a good manner. There are two currencies used in Cuba, mainly for foreigners "CUC" and for Cubanos "CUP" are used. 1CUC (about US$1) iequals to 24CUPs. Foreginers can use both currencies, but those touristic shops and restaurants accept only CUC. It seems like those CUP shops are subsidised by the government and selling things really at low price, but there aren't much choices and the quality of goods are low. I guess foreigners are supposed not to use CUP. But we can exchange CUC to CUP easily at money exchanges at the airport and in city. I stayed in Cuba for 15days and used 508CUCs. On average, I used 33CUCs a day. It was not expensive but not cheap eaither. The airport tax is 25CUCs, and I spent 50CUCs on taxi, those were very expensive. Basically, accomodation and transportation costs are high in Cuba. Even the handful of men/wemen with aspirations led the revolution and inspired people, they cannot achieve or cannot even come close to their ideas? It may be better to follow as time goes by? 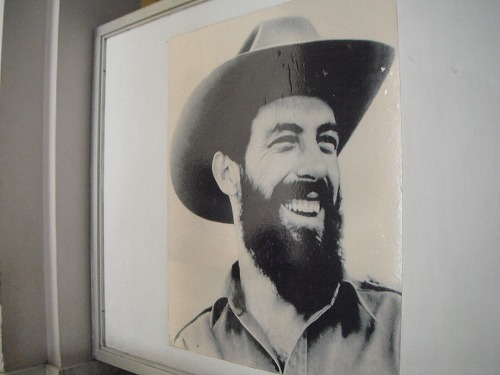 There are Pros and Cons that Fidel Castro Ruz had done, but I am sure that he thought "I have to do something about Cuba",risked his life to make better Cuba, and made the revolution. From what he said, and wrote, I am sure that Ernesto "Che" Guevara also faught for the better future of people. The enemy they tried to defeat was "Injustice and Inequality" of this world. It has been 52 years since the revolution. How close have they come to their ideas? I was questioning myself during my trip in Cuba, but I got no answer. But it is true that in the course of history "Heroes" like Fidel and Che came along, made the revolution and changed the future of Cubanos. Human history may be a natural flow, but also artificial, of course. So if it is the case, as Fidel said at the trial of the raid on Moncada barracks, "History will absolve me. " I just follow my belief and go on my way. As a revolusionalist, I will put more efforts and do whatever I can do for the better future of Japan. The diaries of my Cuba holiday are in Part 2 and Part3.